My last show with The Great Giffoni this past weekend was pretty insane. It was for the 17th Annual FernFest, which takes place in a part of Victoria BC known as "Fernwood". In the heart of this area is the Fernwood Square, which has the Belfry Theatre, and a few cafes, restaurants, and shops. The weather went from spitting rain to a soupy, pouring windy mess! I'll believe it's summer on the west coast when I see it, which means I'd have to wait until those 2 weeks in September where I need to break out my portable fan to blow around the warm air and cool things off, along with blowing around the annual fruit flies that circle the middle of my living room. In the midst of rearranging the layout of the magic show under the tents, and talking with the event coordinators and sound crew, I was asked by someone in a giant raincoat why I was "so dressed up". 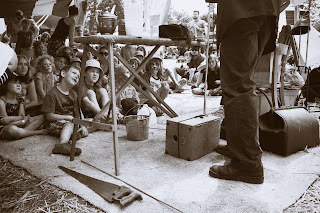 I informed the raincoat that there would be a magic show, so hang tight and check it out! "What kind of magic show? ", the raincoat asked. It wasn't necessarily the best time to describe the act when you're trying to set up for it while there's a drum circle blaring at top volume and sage being burnt and is smoking up your face, and it's raining sideways, the tarps between tents are periodically dumping out water, and all I can think is "my accordion cannot get wet!"... and I also thought "why did I wear my sweet little pink satin shoes?" THEN, my friend from Japan - Misato, who I haven't seen in probably 4 years, called out my name and was suddenly in front of me in the midst of it all. She did this once before -surprise me- in a night club in town. She must have magical appearing/disappearing powers. The Guerrini got home safe and dry. I arrived at the house for a children's birthday party. Went inside, began to unpack my accordion, and wondered if the kid party guests had arrived yet. They had, they were verrrry quietly playing a game in the kitchen, if you consider origami a game. Next thing I know a sitar is pulled from the corner of the room and the birthday girl's father is strumming away... In comes the crowd of soundless children, all eating plate-fulls of humus, raw veggies and fruit. From my experience, I love a group of sugar infused kids screaming with excitement, I thrive off of it! I want to see them jacked up on cupcakes, hot dogs, and chips! Kool-Aid stained grins make for a good time! Plus, I get to leave well before the sugar crash! There's the opposite of silent and organic, where the kids are partying it up, and there's a bouncy castle in the backyard, plenty of snacks to nibble on, and of course: The Parental Freak Out. Parents sometimes lose their cool, and I politely act like I don't notice it happening. The freak out comes from a combination of over-planning or under-planning, too many kids running around high on sugar -oh now I get the raw veggies snack idea!- with not enough adults to keep an eye on them, and probably being tired - which I don't blame them for needing some rest. The freaking out, of course, has a domino effect, and the birthday party stress is passed along to the birthday girl or boy having their own meltdown and crying their eyes out. I hate when this happens :( Alas, it's truly a birthday party when there's cake on the floor, kids are screaming, someone's crying, and Princess Muffin poops - filling the children with so much joy! A pooping chicken gets them every time! "SHE POOPED!" - they all yell! As the show was about to begin, I was tinkering around on a few notes, getting myself in the zone and a young boy asked "What are you doing?" I answered "Getting ready for the magic show!" he replied with telling me he's seen the show and then recites the tricks to all the other kids, before each trick happens. There's always one! A super cute little boy came up to me right before a show began to ask me, with his big blue eyes looking deeply into mine, "Have you seen "Mary Poppins"?" I answered saying "Yes, I have! What is your favourite part?" the boy stood there thinking for a second and tells me "I like the part when they fly on the bed". I was puzzled, but smiled at this sweetie pie. 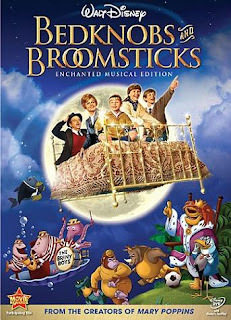 I think he saw a different movie, "Bedknobs & Broomsticks", but he totally had me smitten! As I was getting settled in, about to start the show a sweet little girl came up to me to ask, "Do you like my dress?" "Why yes, I do! It's very pretty, where did you get it?" "My aunt made it..." "Oh wow, that's so nice!" "Ya... but she is living with us now.. because she had too many boyfriends..."
As I got myself set up on the stage for this public event, a man involved with running the show began chatting me up. "You were at Disneyland, right?" "Disney World, yes", I answered. I feel the need to explain the difference between the two. You see, Disneyland is 160 acres, while Walt Disney World is 31,000 acres or 40 square miles. A pretty huge difference! "I wouldn't want to work for them! They probably brainwash all their employees..." I replied with "Uh, no, and it was a great experience..." trying to lighten his comment to me, and he then continued to tell me about how he turned down a great opportunity with the CBC, and his friend who did work there is now making more in his retirement then he was currently working 40+ hours a week. I was waiting in a hallway at a larger event which we were booked for when a man walked by looking at me with wonder. He complimented me on my outfit, and then went on to ask, "So, do you make money as a musician? I mean, is this what you do? Or do you do anything else? And, you can pay the rent?" You know something, I really enjoy questions like "what kind of events do you perform at?" or "how long have you been performing with the magic show?" or "It must be so much fun performing for children". Those kinds of non-income related questions are quite nice! For some individuals, boundaries are flexible. I was on a stage, getting ready to start and a man came on to the stage and right up to my face, a very close-talker, to say "ARE YOU EVER BEAUTIFUL!" He was a kind man, with missing teeth and I think he was wearing a muumuu. He also wanted to know if I was going to play any Zydeco tunes, and then left the stage. I had more time to waste before one show, and so I waited in the entrance way near the washer and dryer. A few guests came in and I said "Hello", while I sat on a bench. An older gentleman came in, surprised to see me he asked "Are you the entertainment?" 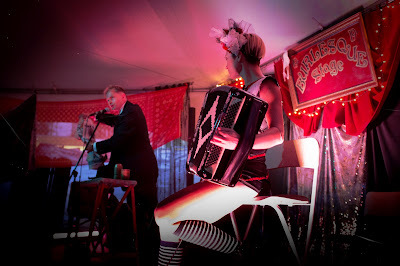 and I answered "Yes, I accompany the magician with my accordion". He sat down next to me, so he could put on his slippers - which had lights in the toes I might add - and then proceeded to tell me about his 70th birthday party, a few years back. Those who threw this party for him hired a stripper to entertain him. He went into great detail, which I'll spare you, about the strippers 'features' and where she did not have hair growing, and what all she did for him. Luckily, The Great Giffoni came over to me, saving me from this conversation. It's always a pleasure to perform the magic show. I'm off to my next adventure, so we'll see where our paths cross again and when they do the show will be FANTASTICO!